So, that’s about it. 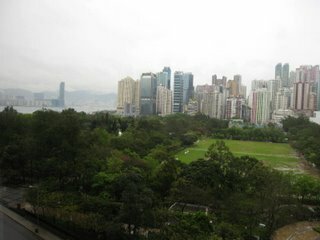 Here’s one more Hong Kong skyline shot that I took out of my hotel window before I left. It was an amazing trip. For those who enjoyed the touristy stuff at the beginning of this travelogue, sorry I had to slip into a lot of FH business. But, given the fact that the company paid the significant expense of the trip, you’ll understand why I had to actually do work. Asia is an extraordinary place and I do hope to find ways to continue to be involved in the region. It is clearly very foreign in may ways, but it is remarkable how similary many of their challenges are. I was amazed to read in the paper on the way to the airport about the legislation pending in China that would criminalize unauthorized domestic spying. And listening to the local people who spoke to us in Beijing gave new meaning, really new meaning, to the phrase “All politics is local.” Even in undemocratic societies, the opinion of the public matters and cannot be ignored. That bodes well for the business I’m in. I will return to ranting about George Bush and the Republicans after I get over my jet lag.